Get Set Go is a band formed in 2003 in Highland Park, Los Angeles, California. They are known for a tendency to mix dark lyrics with upbeat or catchy melodies. Outside of the BBverse, they are well known for being heard on several episodes of Grey's Anatomy and both volumes of the series soundtrack. Their debut on NSFW was performing in the Summer Music Series on episode #89. Mike and Eric agreed to perform on the show after hearing about the show from one of their long-time fans, and subsequently watching tens of episodes. After their performance chatrealm donated upwards of at least 2220 USD to their kickstarter with over 100 additional backers, and Mike wrote a glowing endorsement of the NSFW Show. OhDoctah donated 200 USD during the show after they won him over with their second song. Get Set Go was then raised to poster child status of the Summer Music Series, and much love was reciprocated to and fro between both the NSFW community and the Get Set Go community. 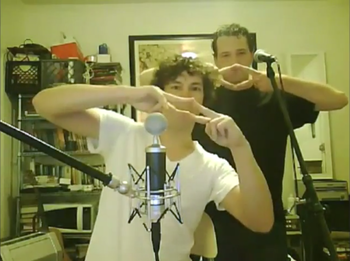 Mike and Eric have been known to host a number of live performance sessions on ustream and jtv, not only to keep in practice (especially in preparation of shows/tours) but also to maintain the intimate relationship they have with their small and dedicated fan base. This was also occasionally used as a testing ground for new songs. On Saturday, August 26th 2011, the band held a 12 hour Sing-Along-A-Thon. Many familiar faces from Diamond Club rotated in and out of the chat throughout the day, and both TheLordNikon and Gatowag endured the entirety of the event. Get Set Go is credited with creating the iconic song used to close NSFW. A link to the song and its backstory and lyrics are found on its own page. This page was last modified on 8 August 2012, at 14:50. This page has been accessed 4,275 times.